Today, I’m partnering up with Gorton’s and their “Going Global with Gorton‘s” campaign, where they are featuring recipes that pull culinary inspiration from around the world. My recipe for Firecracker Shrimp Rice Bowl combines flavors from some of my favorite Asian cultures and brings them together for an easy to recreate dish that’s packed with flavors, textures, and bright colors! Asian food is hands down my favorite. 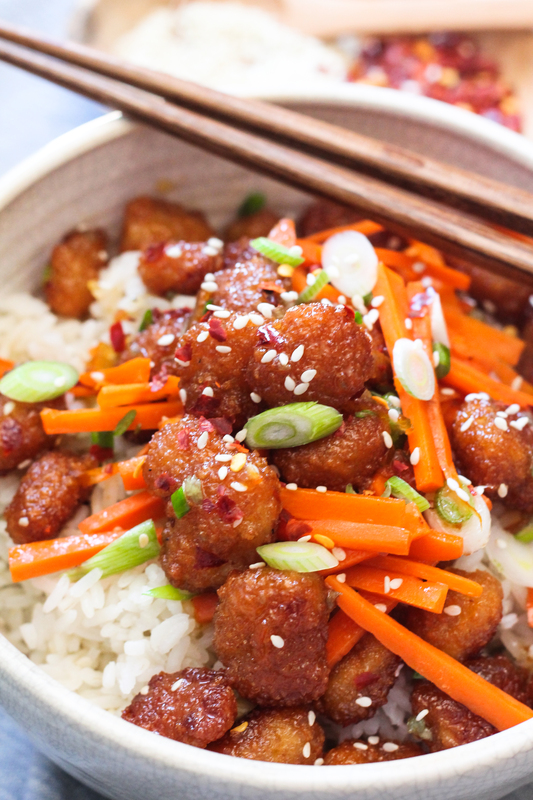 Sure, I was born and raised in a warm Caribbean island but there’s something that I have always loved about all types of Asian cuisines and today I’m excited to share this recipe with you! It brings together a few of my favorite Asian-inspired flavors and pairs so deliciously well with any day of the week! This Firecracker Shrimp Rice Bowl recipe has become a weekly favorite because of the flavors and textures of the dish. Imagine your favorite sweet sticky yet spicy Asian dish, but made with Gorton’s Popcorn Shrimp, a staple in our home. Lightly seasoned and breaded shrimp is tossed in a sauce that I’ve created to be delicious and super simple! You might be wondering, frozen breaded shrimp? Here’s the thing about Gorton’s. Gorton’s strives to bring the freshest high quality seafood to consumers while protecting the world’s resources, and forge long-term partnerships with suppliers that are committed to the same high standards. While the majority of their seafood is from certified sources, their Trusted Catch™ program goes beyond certification and enacts real change in the industry and on the water. Gorton’s utilizes the latest in scientific data and best practices to ensure that their seafood is sourced responsibly today and for generations to come. For sourcing shrimp, Gorton’s also works with aquaculture (farmed) sources. They choose aquaculture partners that take steps to minimize environmental impacts of farming, ensure farmed fish are treated responsibly and protect the conditions of farm workers. Which is incredibly important to me, and I’m happy to work with a brand that also finds it important. The sauce is made up of a few pantry and fridge ingredients you probably already have: orange marmalade, orange juice, soy sauce, sesame oil, honey, and garlic. The flavors work well together and when brought to a simmer, makes a sticky sweet sauce that pairs well with the crispy shrimp. Once the shrimp is baked, it’s tossed in this sauce and served over rice with a side of sautéed carrots. But you can sauté any vegetable you’d like – hearty greens, bok choy, or even raw cucumbers would work well in this dish. Like it extra spicy? Add some extra crushed red bell pepper flakes for heat! Here’s to hoping this recipe inspires you to pull culinary inspiration from around the world – whether it’s Asian, South American, or even getting inspired from regions of the USA. Food has no boundaries and Gorton’s is a brand I love to use as a canvas to showcase that creative inspiration! Check out Gorton’s Recipes for more inspiration! This recipe for Firecracker Shrimp Rice Bowl is easy to put together and is packed with flavor! Preheat oven to 425F and lay all the shrimp poppers in a layer on a baking tray. Bake per package instructions until crispy. In a saucepan, whisk together the orange marmalade, soy sauce, honey, sesame oil, orange juice, and minced garlic, over medium heat. Season with salt and pepper to taste. If you like some heat, add 1-2 teaspoons crushed red pepper flakes. Cook rice per package instructions. Meanwhile, saute carrots in a bit of olive oil and season with salt and pepper. 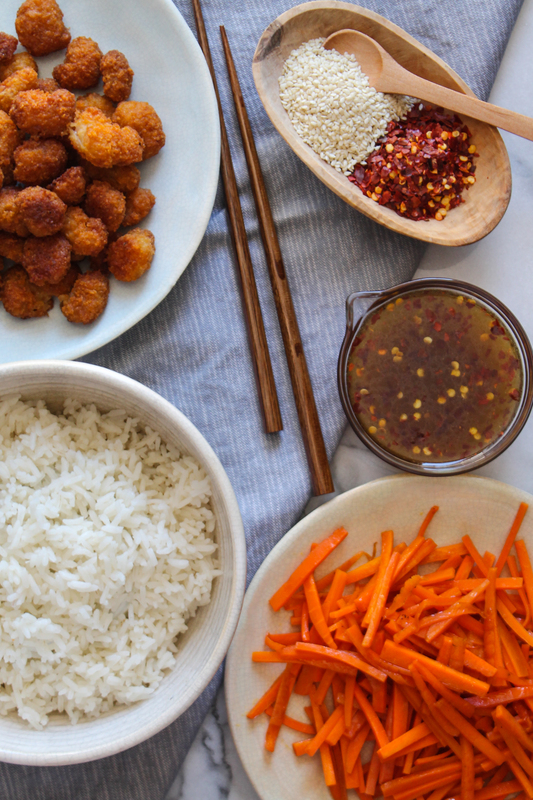 To serve: toss crispy shrimp poppers with sauce and layer over cooked rice and sautéed carrots. 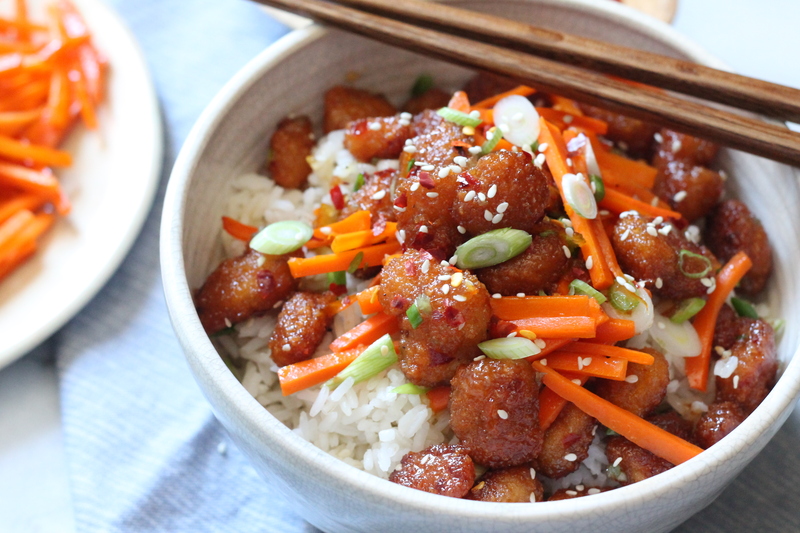 Serve with extra sauce on the side, a sprinkling of scallions and sesame seeds, and enjoy! Disclaimer: This post is sponsored by Gorton’s Seafood – thank you for supporting brands that compensate me to create recipes for you! Opinions are 100% my own – I’d never recommend a product I don’t already purchase in my own home. What a great idea !!! I will definitely try this !!!!! Sounds delish !!!!! !